The Clackamas Soil and Water Conservation District has four top priorities when addressing conservation needs in Clackamas County: water, wildlife, weeds, and working lands. These priorities are part of our larger set of District W’s. The District’s plans and budgets are developed with these priorities in mind. The District’s focus on water revolves around water quality and water quantity. Our goals are to protect and restore the quality of surface and ground water, and assure adequate future supplies of water for people, plants, and animals. District programs include water quality monitoring and many conservation practices in rural and urban landscapes. On the farm, heavy use areas and filter strips protect animals and water. Improving irrigation system efficiency means agricultural operations use less water. Calibrating spray nozzles and paying attention to wind drift reduces the quantity of pesticides used. This not only saves farmers money, it also reduces the amount of pesticides that may get into surface water. Around buildings and paved areas, rain gardens and bioswales help to clean water before it infiltrates into ground water. Our wildlife priority is about developing habitat conditions to enhance the life cycle of wild creatures, including fish. Our habitat and riparian restoration activities are focused on habitat but also provide water quality benefits. Restoration can yield remarkable results. Compare the condition of a site on Milk Creek in 2012 (before restoration) with how it looked in 2016 (after restoration). It’s hard to recognize that these photos are of the same place! Recent work to restore oak habitat on private lands fits within our wildlife habitat priority. The District is increasing investments focused on oak habitats. Detecting, controlling, and eradicating invasive plants summarizes our invasive weeds priority. Invaders affect wildlife and crop production. Weeds can pose health risks to people and animals. We invite you to learn more at https://weedwise.conservationdistrict.org. 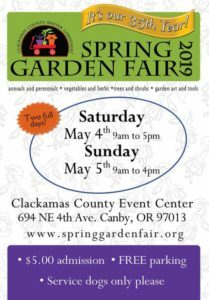 Clackamas County has an abundance of farms, fields, and forests. We call these working lands. This category captures our work to help keep agricultural lands healthy and productive. The working lands priority was added to our list of top priorities by the Board of Directors in 2014. According to Clackamas County, “Some of Oregon’s richest farmland is located in areas surrounding the communities of Canby, Sandy, Boring, Wilsonville and Molalla.” Drive a few minutes from any city in Clackamas County and find yourself in open spaces that provide farm and forest jobs as well as rich wildlife habitats. Our work with nurseries, Christmas tree farms, crop and food producers, and farmers markets all fit in this category. Please do share with us your thoughts on conservation needs and priorities.